Nature inspired the design of silicone and gallium composites created in Rice University's Nanomaterials Laboratory. Photo: Jeff Fitlow/Rice University. Materials scientists at Rice University are looking to nature – at the discs in human spines and the skin in ocean-diving fish, for example – for clues about designing materials with seemingly contradictory properties – flexibility and stiffness. Graduate student Peter Owuor, research scientist Chandra Sekhar Tiwary and colleagues in the Rice laboratories of Pulickel Ajayan and Jun Lou found they could increase the stiffness, or ‘elastic modulus’, of a soft silicon-based polymer by infusing it with tiny pockets of liquid gallium. Such composites could find use in high-energy absorption materials and shock absorbers, and in biomimetic structures like artificial intervertebral discs. The scientists report their findings in a paper in Advanced Materials Interfaces. Owuor said conventional wisdom in composite design for the past 60 years has been that adding a harder substance increases modulus and adding a softer one decreases modulus. In most instances, that's correct. "People had not really looked at it from the other way around," he said. "Is it possible to add something soft inside something else that is also soft and get something that has a higher modulus? If you look at the natural world, there are plenty of examples where you find exactly that. As materials scientists, we wanted to study this, not from a biological perspective but rather from a mechanical one." For example, the discs between the vertebrae in human spines, which act like both shock absorbers and ligaments, are made of a tough outer layer of cartilage and a soft, jelly-like interior. And the outer skin of deep-diving ocean fish and mammals contain myriad tiny oil-filled chambers – some no larger than a virus and others larger than entire cells – that allow the animals to withstand the intense pressures that exist thousands of feet below the ocean's surface. Choosing the basic materials to model these living systems was relatively easy, but finding a way to bring them together to mimic nature proved difficult, said Tiwary, a postdoctoral research associate in Rice's Department of Materials Science and NanoEngineering. Polydimethylsiloxane (PDMS) was chosen as the soft encapsulating layer for a number of reasons: it's cheap, inert, nontoxic and widely used in everything from caulk and aquarium sealants to cosmetics and food additives. It also dries clear, which made it easy to see the bubbles of liquid the team wanted to encapsulate. 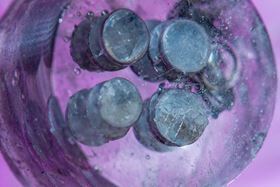 For that, the researchers chose gallium, which like mercury is liquid at room temperature, but unlike mercury is nontoxic and relatively easy to work with. Owuor said it took nearly four months to find a recipe for encapsulating bubbles of gallium inside PDMS. His test samples are about the diameter of a small coin and as much as a quarter-inch thick. By curing the PDMS slowly, Owuor developed a process by which he could add gallium droplets of various sizes. Some samples contained one large inner chamber, while others contained up to a dozen discrete droplets. Each sample was subjected to dozens of tests. A dynamic mechanical analysis instrument was used to measure how much the material deformed under load, and various measures like stiffness, toughness and elasticity were measured under a variety of conditions. For example, with a relatively small amount of cooling, gallium can be turned into a solid. So the team was able to compare measurements taken when the gallium spheres were liquid with measures taken when they were solid. Collaborators Roy Mahapatra and Shashishekarayya Hiremath of the Indian Institute of Science at Bangalore used finite element modeling and hydrodynamic simulations to help the team analyze how the materials behaved under mechanical stress. Based on this, the researchers determined that PDMS with pockets of liquid gallium possessed higher energy absorption and better dissipation characteristics than plain PDMS or PDMS with air-filled pockets. "What we've shown is that putting liquid inside a solid is not always going to make it softer, and thanks to our collaborators we are able to explain why this is the case," Tiwary said. "Next we hope to use this understanding to try to engineer materials to take advantage of these properties." Owuor and Tiwary said that using nanoengineering alone may not provide a maximum effect. Instead, nature employs hierarchical structures with features of varying sizes that repeat at larger scales, like those found in the oil-filled chambers in fish skin. "If you look at (the fish's) membrane and you section it, there is a layer where you have spheres with big diameters, and as you move, the diameters keep decreasing," Owuor said. "The chambers are seen across the whole scale, from the nano- all the way out to the microscale. "There are important nanoscale features in nature, but it's not all nano," Tiwary added. "We may find that engineering at the nanoscale alone isn't enough. We want to see if we can start designing in a hierarchical way." Researcher Elvin Karana believes materials elicit unique experiences, within and beyond their utility in a product.